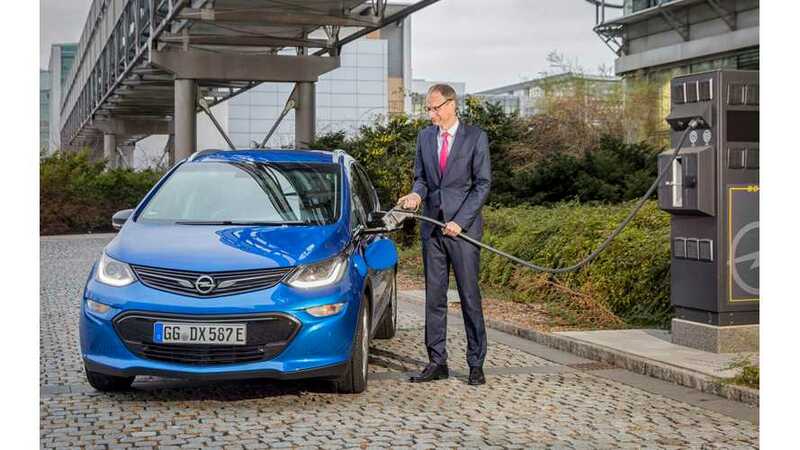 Opel Wants 1,300 EV Chargers In Its "Electric City"
Opel has announced a new initiative (in partnership with Rüsselsheim and the RheinMain University) to convert its hometown - Rüsselsheim am Main in Germany - to an “Electric City” through installing up to 1,300 charging points by 2020. The federal government approved a €12.8 million grant for the project. When the project is completed, Rüsselsheim will have highest charging point concentration in the European Union. Each publicly accessible charging point will service 72 inhabitants. Not bad for a city with well below 100,000 inhabitants. For comparison, Hamburg - the city with the highest number of charging points in Germany - has 785 public charging points for 1.8 million people. By the end of 2020 Opel should have 4 new plug-in electric cars (including Grandland X PHEV and Corsa BEV) on the market, besides the Opel Ampera-e (European version of Chevrolet Bolt EV), which will be probably kept on until EVs from PSA take off. The project envisions several charging farms - three with 200 and one with 90 AC charging points, as well as 350 charging points at Opel. The rest seems to be spread around the city. "Sponsored by the Federal Ministry of Economics, the installation of around 1,300 charging stations across the city will commence in the upcoming months. These will then be located in all districts and residential areas, on the Opel premises, on the campus of RheinMain University, in residential estates of gewobau Rüsselsheim, on the parking areas of selected supermarkets and shopping centres and on the premises of the municipal clinic (GPR). The ambitious project, for which the partners have received the official grants totalling around €12.8 million, will be realised in multiple steps by 2020.Going forward, each publicly accessible charging point will service 72 inhabitants, thus creating the highest density of charging stations in relation to the number of inhabitants not only in Germany but in all of the European Union. In addition, another 400 charging points will be installed on privately owned land – 350 of these on the Opel premises. In comparison, Hamburg, currently the leading German city with regards to charging infrastructure, has 785 publically accessible charging points for its 1.8 million inhabitants (city ranking of the Federal Association of Energy and Water Industry)." "Opel’s contribution to the project includes parking areas, which will be fitted with 600 charging points and be accessible to the public after completion of the work. Furthermore, charging points will be installed at 350 parking spots for the Opel company car fleet." "Thanks to the involvement of RheinMain Univeristy, the city of Rüsselsheim will become an urban laboratory for electro-mobility unparalleled in Germany. In the process, technical topics such as supply stability and network integration, along with socio-economic aspects such as mobility behaviour will be examined. The data on the charging behaviour will enable the scientists to predict future demands placed on the electricity network and help them identify the individual needs of electric car drivers. In addition to up to 20 charging points, RheinMain University will also install energy storage systems. These are designed to improve the use of renewable energies and therefore minimise the necessary network extension." 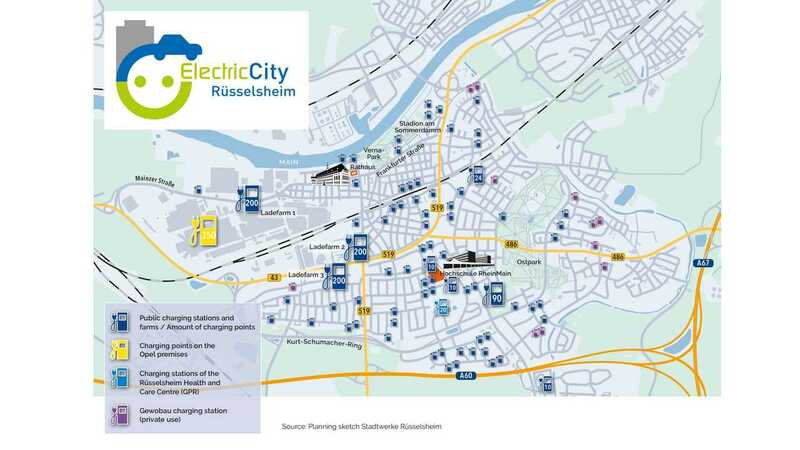 “The transition to electro-mobility is creating opportunities for Rüsselsheim. The city can take on a leading role for charging infrastructure, for electric vehicles and for electro-mobility in Germany thanks to this unique partnership. The project will strengthen the city as an industrial location and increase our capacity to innovate,”. “Opel goes electric! This promise is a core pillar of our PACE! strategic plan. And obviously a massive extension of the charging infrastructure at our Rüsselsheim headquarters is important. This is the consistent continuation of our electro offensive,”. “The university is making an important contribution to the urban development of Rüsselsheim with its project-specific research. This underlines the approach we chose, which is to further strengthen the strategic role of universities in regional innovation systems,”.